The governor of the Bank of England has given his strongest warning yet about the dangers to Britain's economy posed by the booming housing market. 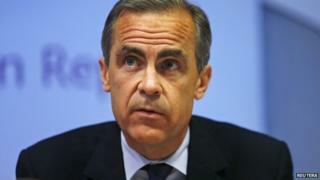 Mark Carney said the market represented the "biggest risk" to financial stability and the long-term recovery. He added there were deep structural problems which needed to be addressed. He told Sky News the fundamental problem was a shortage of homes - and the Bank of England had no solution to that. In an interview on the Murnaghan show, he said the Bank was "closely watching" rising property prices and the subsequent increase in large-value mortgages, which he warned could lead to a "debt overhang" which could destabilise the economy. Mr Carney said: "When we look at domestic risk, the biggest risk to financial stability and therefore to the durability of the expansion [of the economy]; those risks centre in the housing market." He added: "There are not sufficient houses built in the UK. To go back to Canada, there are half as many people in Canada as in the UK, twice as many houses are built every year in Canada as in the UK and we can't influence that." Official government figures show the country began work on 133,650 homes in the year to March, a rise of 31% on the year before. A former government advisory body has said the UK needs to build almost 300,000 homes a year until 2031 to meet current demand. Prime Minister David Cameron, who was also interviewed by Murnaghan, admitted the government needed to build more houses and said Mr Carney was "absolutely right". He said: "The building of houses is going up. If you talk to any housing developer at the moment, or builder, they will tell you that the Help to Buy scheme... has been hugely helpful in bringing forward more development or house building." The deputy prime minister, Nick Clegg, echoed that point. He told the BBC's Andrew Marr: "The big long-term problem is that we simply do not build enough homes in this country." But Mr Clegg also said the government should scale back its Help to Buy scheme, if the Bank concluded the housing market was overheating. Mr Carney said he was watching the housing market closely, and would tell the chancellor if he believed changes needed to be made: "We could limit amounts of certain types of mortgages that banks could undertake, we could provide advice. The chancellor has asked us if we would provide advice on changing the terms of Help to Buy." Mr Carney said the Bank had an important role behind the scenes: "What we can influence is whether the banks are strong enough. "Do they have enough capital against risks in the housing market, whether underwriting standards are tough enough so that people can get mortgages if they can afford them? "And by reinforcing both of those we can reduce the risks that come from a housing market that has deep, deep structural problems." Housing analyst Henry Pryor said the Bank was also acting to ensure people did not borrow more than they could afford: "What they are doing is bringing in these new regulations [which include a series of tougher questions about ability to repay] to make it much harder, much tougher, for those of us who need a mortgage in order to buy a house, to actually qualify for one. "And it's tricks like that, it's little wrinkles like that, that the Bank of England are going to use in order to try and dampen down over-enthusiasm in the housing market." Major lenders calculate house prices are rising at roughly 10% a year - the highest since the credit crisis of 2008. The average UK house price is around £180,000. The governor's warning comes amid a rising a chorus of concern. Sir Jon Cunliffe, one of the Bank of England's deputy governors, previously said it would be "dangerous to ignore the momentum that has built up in the housing market". The region where prices are rising fastest - at double the national average - is London and the South East. But Mr Carney said that situation was beyond his control - and was not a threat to the rest of the country: "There is a large cash market in London, a particularly foreign aspect to it. From our perspective they don't cause risk to the British economy."